WILLEMSTAD - Aruba, Curaçao, St. Maarten and the Netherlands, on behalf of the BES islands (Bonaire, St. Eustatius and Saba) are working on an intention statement regarding information exchange to prevent illegal migrants from island-hopping within the Dutch Caribbean. The four Justice Ministers of the Kingdom held their regular law enforcement consultations in Willemstad. 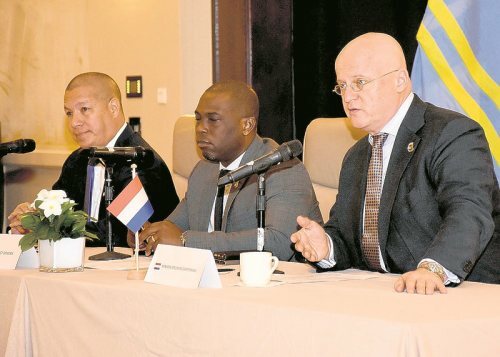 St. Maarten’s just-sworn-in Minister Cornelius de Weever attended the meetings but was not present for the closing press conference by his counterparts; from left to right Adin Bikker (Aruba), Ferdinand Grapperhaus (the Netherlands) and Quincy Girigorie (Curaçao). Photo: Three Ministers of Justice: Grapperhaus (The Netherlands), Girigorie (Curacao) and Bikker (Aruba). De Weever (St. Maarten) was absent.